Creative bing! Innovative bong! Content delivery bish! Direct Mail bosh! The Direct Marketing Association represents the UK’s multi-billion pound direct marketing industry. With over 1,000 UK company members the DMA offers the latest and most creative thinking and the greatest community of digital and direct marketing experts, leaders, shapers, and creators. For the prestigious 2016 DMA awards ceremony that celebrates and rewards the best thinking innovation and results across the marketing industry, over 400 experts from leading agency’s, brand’s and suppliers are selected to complete a detailed judging process prior to the event, to determine the best of the best. ‘Sparks of genius. Explosive creative. Game changing results.’ That is what the artwork stated – and those three tenets are nowhere more appropriate than in the conception and development of these packs. With the awards ceremony a major highlight on the DMA calendar, the DMA Awards Team wanted an engaging, innovative and interactive pack to assist the judges with the judging experience. 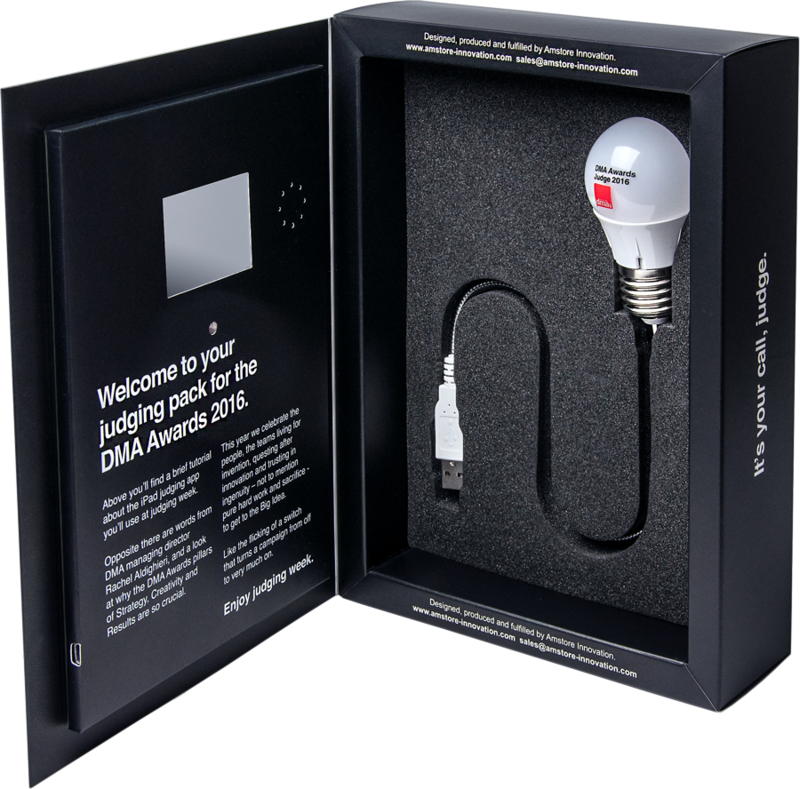 We were once again asked back to be their creative fulfillment partner, and worked closely with the DMA Awards Team to design, create and produce the ‘The Judges Award Pack’. The end result was a creatively designed, bespoke direct mail pack! When the cover was opened the VideoPak screen auto plays through cool light sensor technology. The pack contained a bespoke, branded super bright USB light bulb as well as printed inserts with details and rules for the event. It was set in custom made foam fitment and the pack had printed outer sleeve for protection through the mailing process. Recipient address labels were printed and affixed and the packs were mailed out directly to each of the judges. The pack was produced in a fast turnaround – less than 2 weeks. The clever box, with interesting USB light bulb was very well received by the judges. ‘Sparks of genius’ – it definitely was and Rachel Aldighieri, DMA Managing Director said “I thought the pack was great – lots of lovely feedback!